Tuesday, June 21 began with the promise of a beautiful early summer day, and it did not disappoint. 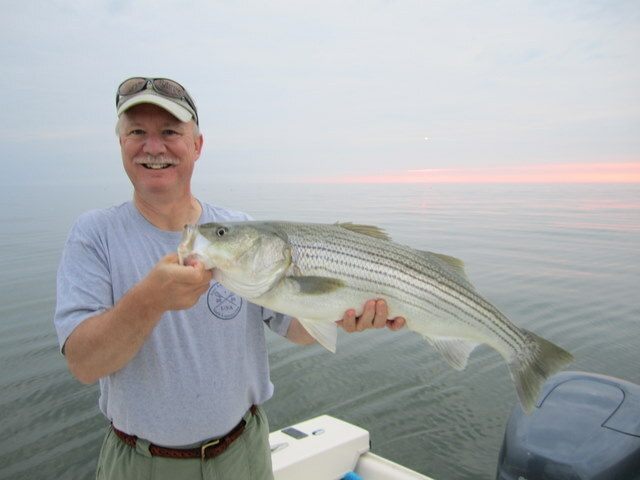 Don Harrison and daughter Amy met me before sunrise at Somers Cove Marina with the promise of some early topwater action on a flat, calm Tangier Sound. 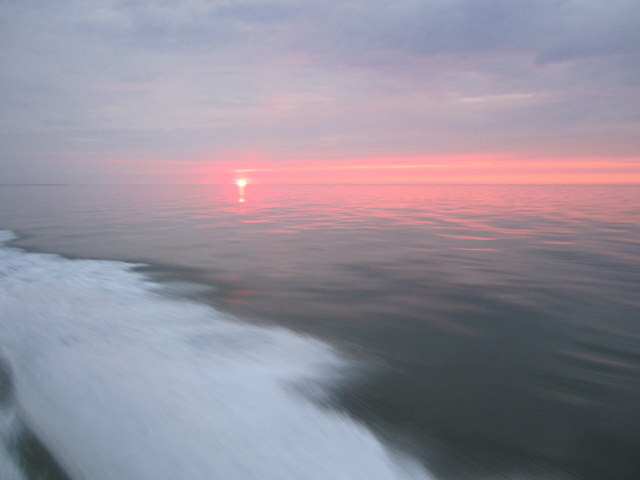 The cruise south to the fishing grounds was smooth, and halfway to our destination we were greeted with a fabulous sunrise. We couldn’t have asked for a better start to the day. I pulled up to the exact spot where we did so well on the previous Saturday and everything looked just right. On Don’s second cast with a Stillwater popper there was a massive blow-up on his lure, and after a good fight he landed a fat 32 inch rockfish! Don was all smiles and I was secretly counting off in my head a number well into double digits as to how many stripers we would catch & release today. Don had another strike a minute or two later and landed a nice 23 inch fish. Amy got in on the action with a small schoolie and all was right with the world. Then the unexpected happened. Everything went quiet. No blow-ups, no current movement, no wind, no nothing. The fishing came to a screeching halt after just ten minutes. No problem I think. As I had dropped anchor, I just figured that we’d reposition the boat a little and find the school. Hmn! It was like Don’s big rockfish had swum off and warned all his friends. Granted we had a few more hits on poppers, caught a few fish on shads, but the place just went still. With one exception. There were cow nose rays cruising everywhere. I hadn’t noticed them before, but now I had plenty of time to look. Call me paranoid, but I’m a firm believer that when large numbers of the big (30 pound plus) rays take-over an area the rock and specks skidaddle. I’ve seen it happen too many times to be a coincidence in my books. After about two hours of moving around with limited success, we decided to head to the flounder grounds. This has become a routine for me of late. Rock on top early then jig bucktails for flounder. Even the diehard fly fishermen love to see the flounder come aboard. We got rigged up for the flounder and Don and Amy immediately went to work. I enjoy taking folks flounder fishing as they are always surprised at the size of the fish when it lays there shimmering just below the water’s surface. 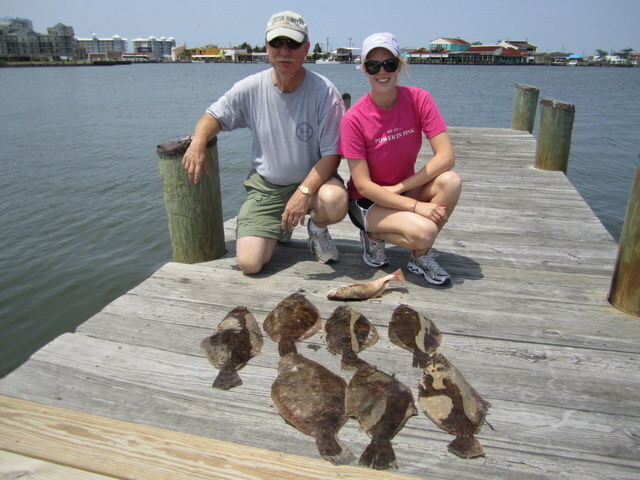 For the next couple of hours we had steady action with beautiful summer flounder from 18 to 23 inches and one very nice croaker. All-around, it was a great day on the bay for this father and daughter team.